ASCII Chart ">ASCII is an acronym for American Standard Code for Information Interchange. You can see now why they shortened it down to ASCII which is pronounced as 'askey' by us geeks. This is the most common code for the exchange of letters and control characters between computers and their peripheral devices like printers. It is a standard that provides an easy way for the letters on our monitors to get into a binary format that a computer can understand. Thus it also finds its way into our everyday PLC lives in form of serial transmission to a display or printer. Just by chance a recent article in the LA times obituaries entitled "John Diebold, 79: Pioneered Computer Use in Automation of Business" caught my eye. It's interesting to read about his life as he is credited with coining the term "automation". Automation is such a normal everyday term for me that I can't even conceptualize a time when somebody would have to think about and try to "sell" the concept. The object of a PLC simulator is to 'fake out' the input into a PLC so that the programmer can test and debug the program before installation into it's operating environment. Our patent pending PLC simulators achieve this by mounting on the existing terminal strip of the PLC card and providing easy controls to turn digital inputs on/off or adjust analog signals. 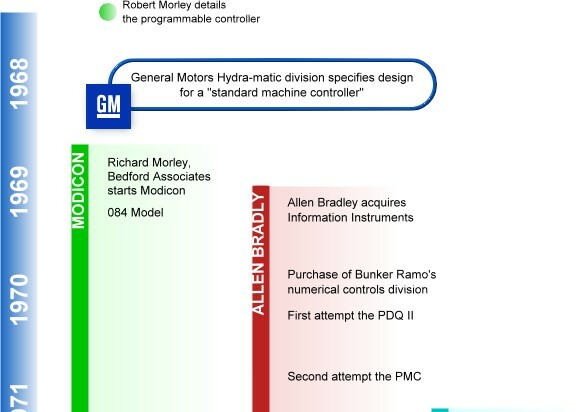 The early history of the PLC is fascinating. Imagine if you will a fifty foot long cabinet filled with relays whose function in life is to control a machine. Wires run in and out of the system as the relays click and clack to the logic. Now imagine there is a problem or a small design change and you have to figure it all out on paper and then shut down the machine, move some wires, add some relays, debug and do it all over again. Imagine the labor involved in the simplest of changes. This is the problem that faced the engineers at the Hydra-matic division of GM motors in the late 1960's. 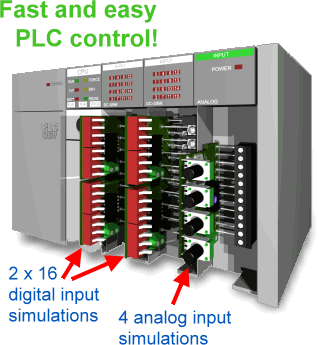 Let's delve deeper into PLC programming by considering again our common word made of 16 bits. If it was all filled up with one's then the decimal value would be 65535. So a range from 0 to 65535 could be represented. Adding binary numbers together would be very similar to addition in decimal. For example 0 + 1 = 1 and 1 + 1 = 10 (carry the one). The problem comes when you need to subtract. How do you represent a negative number when you can't just put a minus sign in front of it and say it's good? Remember that the computer can only do a 0 or a 1. To our rescue comes a concept called taking the complement. Complement's are a pretty cool trick and you can learn more about them at Wikipedia. We'll keep it simple here and talk about two's complement which is the most common in computers and PLCs. You're throbbing head is probably all ready telling you that binary numbers are not easy to read. As a compromise between humans and computers the octal (base 8) and hexadecimal (base 16) are used. While octal is not as common as it's cousin hexadecimal it is still used in various PLCs so it's important to grasp the concept. For instance, when programming an AutomationDirect PLC the memory addresses are in octal. Octal, like an octopus' eight legs, means eight and therefore there are eight numbers to use from zero to seven. The column weights are 1, 8, 64, 512, etc. The weights are derived by taking the base number to the power of the column, 80=1, 81=8, 82=64, 83=512, etc. Now we can do the same exercise as in the last chapter to convert an octal number to decimal.